This bumper-sticker headline, borrowed from the sociologist Pauline Bart, speaks beautifully to the latest Wikileaks outpour and the question of what it does and doesn’t mean. I don’t see a convincing way to feel anything other than agnostic about the impact of Wikileaks—specifically about how much damage the latest data dump will do. Choose your expert opinion. Robert Gates and Zbigniew Brzezinski are unfazed. Hillary Clinton is sternly censorious. Joe Lieberman is—Joe Lieberman. Speculation is cheap—so cheap that everyone and her uncle can afford it. If the database is the shape of knowledge in our time, then the definitive act of mediated communication is the data dump. So it is not surprising that the generation that has made the mash-up its prime aesthetic form has produced the data dump. But to put it this way is not to congratulate Wikileaks—at least not without considerable ambivalence. It’s to lament the coming of a certain—shall we say generational?—style of exposé. Wikileaks is the Facebook of whistle blowing. As for the content of the leaks themselves, at least the ones that have emerged thus far, it is not exactly news that the chiefly Sunni Arab rulers hate and fear Shia and non-Arab Iran. Or that the United States is suspicious of Vladimir Putin. Or that Pakistan’s nuclear galaxy is an ongoing nightmare and its military a dubious ally, or that Berlusconi is vain, Karzai paranoid, or Qaddafi wacky (although to be fair, the buxom Ukrainian companion is news). On the other hand, I haven’t been through the whole data dump, and neither, reader, have you. The more secretive or unjust an organization is, the more leaks induce fear and paranoia in its leadership and planning coterie. This must result in minimization of efficient internal communications mechanisms (an increase in cognitive "secrecy tax") and consequent system-wide cognitive decline resulting in decreased ability to hold onto power as the environment demands adaption [sic]. For indeed, where there is a state, there is diplomacy. Where there is diplomacy, some of it must take place out of the spotlight. The diplomats may well be better judges of which part that should be than the bureaucratic squads who stamp classifications on government documents. Surely, overall, the diplomats are better judges than the wild street mobs of the Internet. So the Wikileaks publication of diplomatic cables is an impediment to the sound, constructive work of states as much as to their wicked schemes. Wikileaks cannot automatically—again, on balance—be a gift to the reign of reason. 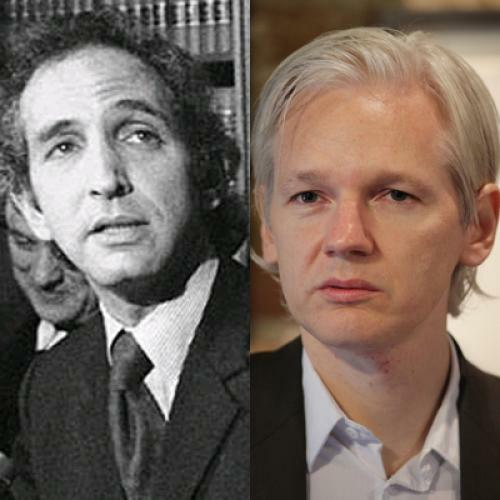 Meanwhile, the twinning of Julian Assange with Daniel Ellsberg as a sort of tag-team of noble leaking, an aristocracy of transparency, strikes me as glib and unconvincing, even if the two men have at times presented themselves as brothers under the skin. When Ellsberg published—made public—the Pentagon Papers nearly 40 years ago, he released a historical book—a more or less coherent, linear, systematic study of decision-making during the Vietnam war, commissioned by Robert S. McNamara when he was secretary of defense, and a systematic revelation of a pattern of government lies and distortions repeatedly issued to the American people. There was little or no news for the Vietnamese in its revelations of what the war was doing to that land. The secrets had been kept not from the adversary but from this hamstrung democracy itself. And the Pentagon Papers did not propound that the state was illegitimate or that it ought to be rendered more stupid, impulsive, cognitively impaired, or ideologically blinkered. Ellsberg's release of the Pentagon Papers was a great democratic act that helped clarify for the American public how its leaders had misled it for years, to the immense detriment of the nation’s honor. By contrast, Wikileaks’s huge data dump, including the names of agents and recent diplomatic cables, is indiscriminate. Assange slashes and burns with impunity. He is a minister of chaos fighting for a world of total transparency. We have enough problems without that. It was always clear what motivated Ellsberg. He turned against the war. He knew how destructive it was. He had worked on the Pentagon Papers. He rightly thought the people had the right to know how a wrong-headed, barbarous war had developed in the shadows, in defiance of public scrutiny. He did not think that the nation-state should be brought to a screaming halt, or that U.S.-out-of-everywhere was a self-evidently virtuous foreign policy program. He knew some truth—not some data—and brilliantly took responsibility for bringing it to light. He was a light unto journalism, which remains in his debt whether journalists know it or not. He made Americans not just better informed, not better titillated, but smarter. I know Daniel Ellsberg. Mr. Assange, you are no Daniel Ellsberg.